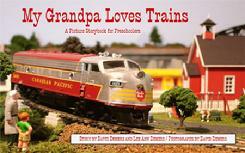 My Grandpa Loves Trains introduces preschoolers to trains and their functions and to basic colors, and it also fosters an appreciation for grandpas. The simple, repetitive story takes place in Marquette, an imaginary (model railroad) village where trains are loved and young people respect adults. The narrator is Timmy, who adores his grandfather and his grandfather�s love of trains. The story, which includes 48 full-color photographs, can be read in five to 10 minutes, which makes it perfect just before bedtime. David Demers is a model railroad enthusiast, a professor, and an author of more than a dozen books on a variety of topics. Lee Ann Demers is his five-year-old daughter, who also loves trains and helped write and edit this book.